...popped up yesterday. It sent a wave of emotions through me. I knew that I hadn't packed this little white vest away, with the other clothing of Carly's..but still, when I came across it, it just ruined my whole day. The memories came flooding back. How I wish I had a picture of Carly wearing this vest. OH MY GOSH, she was so stinking cute in it. She wore her cool little suede shoe boots, jeans and a top...and then this vest. She was stylin' and she knew it! I'm just sick, that I don't have a picture of her wearing this. This little vest is one or several items of clothing that sadly, she didn't get to wear very often. It's like brand new. The little white vest, has hung on our coat rack at our back door for the last 10 months. Untouched. I just couldn't bring myself to take that little vest off of it's rightful hook on the wall. But, due to some remodeling going on in our house, the coat rack had to be taken down for a while. Now that the coat rack is back and as I was rehanging all the coats, this little white vest was at the bottom of the stack. It just completely threw me. Like I said, I knew that little white vest hung on the coat rack - I had no intention of removing it - as far as I was concerned, the little white vest, could hang on the coat rack forever. 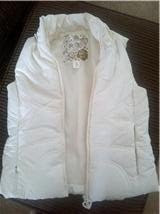 However, when I found this little white vest at the bottom of my stack of coats...it just sent me into a tizzy. It's so strange to me, how certain things/items of Carly's that I run across, can slam me smack dab into a brick wall. It's a deep, crushing pain that hurts so incredibly bad. Even tho., I don't know first hand what it feels like to slam smack dab into a brick wall...it is just what I imagine that slamming into a brick wall would feel like. And believe me, it's not easy to pick yourself up and brush yourself off. It's just NOT that easy. Some days I can go all day without shedding a single tear. Not many days, but once in awhile. But, that just leaves me feeling guilty. Guilty for not crying. There isn't one single minute of my day when I don't think of Carly. She is in my constant thoughts. Constant. If I don't cry, then I convince myself that I must be going crazy. Who wouldn't cry every day over their loss of their 8year old child? Surely there must be something wrong with me. Why don't those tears come every day? Paul's do. Paul is a completely different story. I worry about him. He cries a lot. In fact, he cries all the time. He can't look at her pictures anymore without crying...and I mean sobbing, not just tears running down his face. Sobbing. Often times I think that Paul is carrying around a tremendous amount of guilt. Actually, I know that he is. As Carly laid on our living room floor, lifeless. Not breathing. No pulse. Completely blue. Paul is the one who resuscitated her. He is the one who brought her back. His words to me, as I was in complete hysterics..were, "Joany, I did it, she's back she's okay." That's when the EMT busted through our front door and that's when Carly flipped the lady (EMT) the bird! Paul had saved our baby in our living room and he knew it. But then, in the ambulance..he couldn't save her. He tried. He worked on our girl for 20 miles, to the nearest ER. He feels guilt for not being able to save her, to resuscitate just one more time. Time enough to get her to the ER. The first couple of days after losing Carly, it was me who had to physically pull Paul out of bed (Ashleigh helped me). 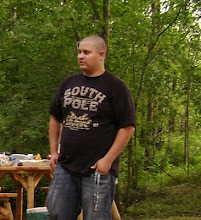 He was in that bad of shape. I wasn't much better, but the toll that working on Carly and not being able to save her life, wreaked havoc on him...and sadly it continues. Maybe that's why my tears aren't flowing as freely. Maybe I feel like I need to keep it together, for the sake of everyone else in my family. But truthfully, I feel like I'm going freakin' crazy. I have no idea how to comfort Paul. How to tell him none of this is his fault. He did do everything in his power to save our baby girl. He fought hard to save her. He worked on her in that ambulance. Paul, is the one that did all the chest compressions on Carly during that dreadful ambulance ride. Paul. NOT the EMT's...nice eh? It was all on Paul's shoulders and he feels he failed his baby girl. Personally, I don't think any parent should have to work on saving their child's life in a freaking ambulance. What the HELL do we even need EMT's for if the parent has to do all the damn work? But hey, that's just me and my thoughts. If you're my friend on facebook, you may have already read what happened last night. Paul and I decided to get out of the house for a while. After the little white vest surfaced, we just needed to get out of here. We headed to a near by town, looking for our replacement flooring,,,yes-our insurance claim finally came through! We hit the flooring store, Target and a couple other stores. We're finishing up the remodeling of our bedroom and I needed some art work/wall hangings for the walls. It's always hard to go into stores these days. I get a cringe in my gut when I walk past the girls clothing. I can't help but glance at all the cute little clothes and boy does it ever sting. While in Target, there of course were kids everywhere...which is fine, but sometimes it just really bothers us. Makes us more aware that our little side kick isn't with us anymore. I reached into my purse to grab a Xanax for Paul and I, but realized that we had taken the bottle out of my purse and never put it back..ugh. We did quite a bit of deep breathing while shopping, and I was sure my rib cage was going to cave in at any moment. But, we made it. After all the shopping, we headed to our favorite Chinese restaurant. We went quite often with Carly. Carly loved Chinese food. We've been there a few times since we lost her. But this time, as we walked in to the restaurant the owner came over to seat us. She asked, in her broken English, "just you two tonight, no little daughter?" It was a nice kick in the gut. Innocent as the question was..it still was a kick to the gut. The poor lady felt so bad. Her chin hit the floor and she turned white as we told her what happened to Carly. No matter where we go, what we do, or how we do anything in our day to day lives, Carly is missed. Sorry for the rambling. Guess I got a bit off focus on this post so I'll wrap it up. As for "the little white vest" I'm going to hang it in it's rightful spot on the coat rack and it may just stay there forever. 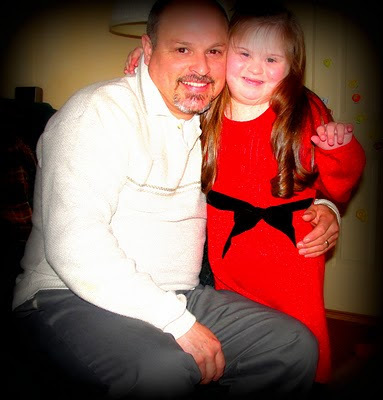 Sending Paul and Carly off to their second Daddy Daughter Dance together. Carly had such a good time at the dance. So did Paul! That night, after the dance, Paul came home telling me that about the only thing Carly said the entire time they were at the dance was, "mama" and that she wanted to "go home to mama". They ended up leaving about 30min's before the dance ended. I'll never forget that night. Carly walked into the house and headed straight for me. I was sitting on the couch visiting with a friend. Carly walked over to me, still in her coat and hat, put her arms around my neck and squeezed so hard. She hugged me like she hadn't seen me in weeks. As she pulled away, she then gave me a big kiss on the lips. Paul came home that night and also told me how all the little girls at the dance treated Carly. Those girls LOVED her. They all argued over which one of them Carly would dance with...Carly, being Carly...ignored them and only danced with her "Paul" Paul said that Carly would look at the girls, shrug her shoulders, in true Carly style and turn around to dance with her "Paul"! Paul and I were so touched by how those little girls treated our sweet little Carly. They loved her. They babied her which was not always a good thing. But, Carly was a tiny little girl and that's' how little girls behave with little ones... they mother them. that we last held our sweet girl in our arms. PLEASE. PLEASE. PLEASE squeeze those babies of yours a little tighter each and everyday. . . and night, for that matter. You never know when your life could be turned upside down. It took a measly 1 1/2 hrs to completely turn our lives upside down and inside out. To break our hearts into a million little pieces and leave us with the greatest loss of our lives. Only 1 1/2 hrs from the onset of trouble right up to the bitter last breaths of our sweet girl. 1 1/2hrs, that's it. A few weeks ago, while packing Carly's clothing away, I posted on my facebook that I wanted to find out where I could get garment bags for children. More matter of fact-ly,,,I wanted "girlie garment bags" I couldn't seem to find any by searching google. Which I don't even have the desire to sit and do searches online. I get so aggravated so easily these past several months. Besides, the only garment bags I could find were adult size. Adult bags would have worked,,,I suppose..but I didn't want Carly's cute little outfits just tossed into an adult garment bag. I wanted something, cute, child sized and girlie like. I was very surprised to receive a private message from one of my facebook friends, who knew where child size garment bags could be found. It just so happens, that my friend Sheri, has a friend who owns a child clothing store...where she does carry child size garment bags!! 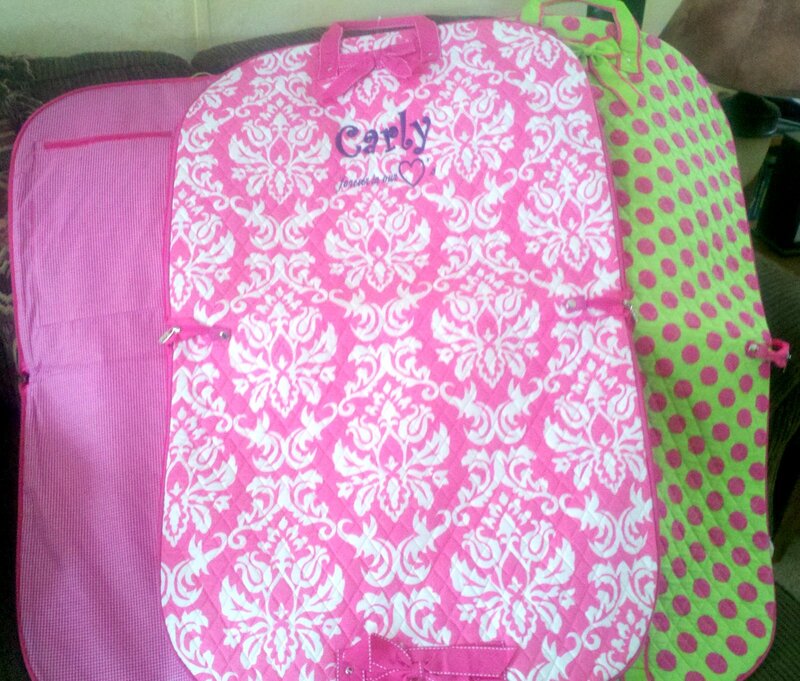 Sheri purchased these three child sized garment bags and sent them to me about a week ago. I can't thank her enough! These are exactly what I had hoped to find! 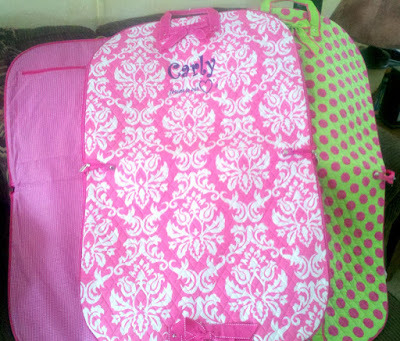 They are cute, little and very girlie garment bags. Cute and girlie, perfect for pretty little girl dresses. We were pleasantly surprise to see that Sheri's friend took the time to embroider Carly's name along with the phrase underneath her name..."forever in our hearts" all done in purple. Awesome! Sheri, I can not thank you enough. These garment bags are exactly what I had hoped to find. I'm so thankful to have such wonderful online friends. I'm continuously amazed by the kindness from others. Others, whom I've never ever met in person. Mostly due to that one extra chromosome. One tiny little extra chromosome has made it possible for me to "meet" the most thoughtful, caring, compassionate, amazing people from all over the world! I'm so thankful for being part of the Down syndrome community. For those of you who don't understand the previous sentence...you're missing out. Believe me, you are missing out! Carly's cute little dresses are safely zipped up and put in the closet. Safe inside those three "girlie garment bags." I took this picture of Carly at the circus last March. I would have snapped a hundred pictures of her sweet face that day. our Valentine Day was spent at the foot our our little Carly's grave site. the snow just as far as Carly's grave site. Most of the graves at the cemetery are completely snow covered. Still. to to the grave and then he clears the snow away from Carly's grave. A well worn path is very evident that we visit our girl quite often. As you view these pictures, what is the first thing you think? Could it be, wow that little girl is missed desperately? Or, wow that was one loved little girl! Or, how sad to have to visit your 8 yr old at the cemetery in order to give her a Valentine? Maybe you think, oh my gosh, these family members have lost their ever loving minds! each day with a tug a million time stronger? The answer to those questions are quite simple, or not so much. Carly is desperately missed. Every. Single. Day. Carly is loved. Our love for her has not changed. Yes, it's terribly sad to visit your child at a cemetery. Be it Valentine's Day or any other day. We also wonder at times, if we've lost our ever loving minds. We don't think so. Not yet anyway. But I can tell you that I understand how a person could completely lose their minds over the loss of their child. The tug we feel in our hearts each and every day, seems to grow stronger. The loss we have suffered is very evident within our hearts. A place that others can not see. Although we can mask our feelings and we know how to put on a smile and laugh from time to time. Do not doubt, that inside of us, our hearts are broken. Broken into a million tiny pieces. There is no way to ever repair our broken hearts. It will not happen. I realize that now, after nearly 10 months. Repairing a broken heart of a bereaved parent just does not happen. Or even the broken heart of a bereaved sibling, for that matter. The saying, "time heals all wounds" ~ well, that couldn't be further from the truth. Time marches on, but our hearts are left behind piled into a crumbled, broken, mess. Unfix-able. As you viewed the above pictures, you can see the love that is of a great loss to Carly's "Sissy". "Happy Valentine's Day monkey. I love and miss you so much." Ashleigh always called Carly "monkey" And just in case you were wondering,,,I have no idea how or why Ashleigh came up with that nickname! February in Michigan is often times, more often than not actually, extremely frigged. You step outside and all the way through your body, you feel the February chill. When you've had to step outside, in Michigan during the month of February, and by the time your my age...you learn to dress appropriately. Boots, gloves, hats, scarves and a nice heavy coat. Which allows you to get to your car, without freezing all body parts! But, the chill that this February brings us is much more bone chilling. We visit our sweet girl in sub zero temperatures. We trek through the snow, which in some spots are up to our (well, my) knees. To go and stand a few moments with the most missed little girl in the world.... In my eyes anyway. Sorry for such a teeny tiny picture. It was taken with my dads cell phone. One day, I'll remember to dust off my camera, that doesn't get a whole lot of use these days... (it was purchased to snap photos of Carly 8 month's before we lost her)... and take it with me on one of our visits. As if the bone chilling weather and the sheer chill, of visiting your 8 year old at a cemetery isn't enough of a February chill...I may as well add this next bit of frustration to the mix! I'm so bent out of shape for the simple fact that the cemetery we buried our daughter in has very poor upkeep, especially during the winter months. NOTHING gets plowed during the winter. NOTHING. Unless of course someone passes away and happen to be getting buried in that cemetery. Carly was buried closer to the main road on which the cemetery sits. But, it's still quite a hike in 3', packed down snow! I pull my Explorer into the messed up drifted, hard, crusted snow that sits over the driveway, back up a couple of times, go forward a few times..not even a 4WD can get through snow that's hard and packed and hasn't been plowed in for ever! I finally decide I'm far enough off the main road to put it in park and make my way to my girl. As I stood there yesterday, placing a vase of red plastic roses, a small pink teddy bear and a plaque that says, "Hugs & Kisses", I was once again floored that I was standing at the foot of my baby's grave site. How unreal this whole thing still feels to me. 9 months later and I just can not believe where we are today, in comparison to where we were last year at this time. Add those feelings and thoughts added to the frigged temperatures, makes for quiet the extreme, February Chill. After leaving the cemetery yesterday, I decided that I was going to head to another cemetery which is in the town we live in. I was just curious as to whether or not it was normal...not plowing cemeteries in the winter months. I mean, why would I know this? I never had a reason to visit a cemetery during winter months. Well guess what I found??? The cemetery in our little town, was plowed nicely. All. The. Way. Through. Probably I shouldn't have done that whole drive by thing, because I got home with the anxiety attack from HELL. I really like the above quote. It's so very true. But somehow, I just can't get beyond the sorrow. Often times throughout the day, I find myself looking in the mirror. I really dislike looking at myself in the mirror. Especially the past several months. Just don't like to see myself. Not anymore. Which makes me wonder just why on earth I continue to even look! What do I see looking back at me? I see an aged, worn down, very sad woman. I see it in my face. I'm pale. I have bags under my eyes, not to mention dark circles. And trust me, it doesn't matter if I wear makeup or not...I'm still a dreadful sight. But, as I look at myself and into my eyes I see sadness. Deep, deep sadness. Have you ever heard the saying "they eyes can tell a story?" Mine sure can. And sometimes, actually quite often, I just know other people can see that my eyes are sad as well. Sorrow. It's there. It shows. Whether I put a smile on my face. Crack a bit of a joke. Or actually, laugh out loud. My eyes tell it all. They are sad. They are lost. I am lost. I've talked with many bereaved parents in the past 9 months. Some have lost children 25yrs ago. And you know what?? Their eyes tell of their sorrow. As I look into their eyes, searching I guess, for a glimpse of sparkle, life, happiness, hope. There is none. STILL. 25yrs later and these parents eyes tell their story. Without even having to open their mouths and verbally tell their own stories. The eyes tell all. As I've mentioned before, I feel like I'm walking around the last 9 months, minus a limb from my own body. That's no joke. That's exactly what it feels like. 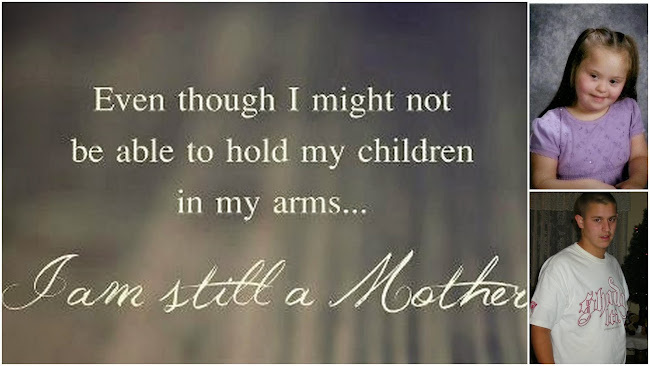 And after talking to other bereaved parents, I've found that they also feel this way. Personally, I'd much rather be missing an arm or a leg, and have my sweet girl right back home, where she belongs. Some would argue "Carly is in a better place now." I beg to differ. HOME is the best place for her. Home with her "mama" "Paul" "sissy" and "bubba" and don't ever tell me otherwise. Mothers know best. And this mama knows, home with us, is what Carly would have wanted. No one can see with their own eyes, that I feel as if I'm missing a limb. But everyone/anyone can look into my eyes and simply see sorrow. See a broken woman. A woman lost, who likely will never find her way out of this gut wrenching grief and sorrow. Each morning when I wake up, I have to force myself out of bed...some may see it as progress in living and going on with life. Going on with this never ending grief. And maybe in some way it is. Believe me, I would much prefer staying in bed all day long. Pulling the covers over my head and just sleep my days away. But, BUT,,,,,the reason I wake up and get out of bed each morning, is because I make myself. I'm trying to survive. I'm doing the best that I possibly can. I will do nothing more than the best that I can. Once I wake up, I look at myself in the mirror...and I see how awfully worn out I look. I look as though I have aged a number of years. I feel it too. I feel worn down in every inch of my body. So not only do I know, that I look awful, my body actually feels it too. Paul and I were at our doctor, Dr. L., the other day. We have a really great family doctor. He has taken such good care of us over the past 9 months. Dr. L., was also Carly's family doctor. He loved her and she loved him. She would walk around his office like she owned the place, mainly because she couldn't stand being in a patient room and waiting...she much preferred socializing. Stopping to tell everyone working at their desks, "hi!" Oh how I miss my sweet girl... Back to our doctor visit, Paul and I have been feeling a little more off, than usual the last couple of weeks. Paul is worn out too. When Friday hits, his worn out body is just that. Worn. Out. He works long hard hours at work each day. And more often than not, he is not feeling well come Friday night. He has headaches, sore throat, ear aches and he just wants to sleep. As for me, I started having dizzy spells again. I guess you'd call it vertigo. As it's not constant. I've been battling vertigo/inner ear infection since April 1st. By the time we lost Carly, my ear infection had cleared. But, it came back very soon after. And throughout the last 9 months, I continue to battle it. In fact, the only time I've had 'healing' of my inner ear infection, over the course of the last 9 months, were the months of Dec and Jan. Low and behold,,, it's STRESS that is causing these illnesses to linger for Paul and me. Stress knocks out a persons immune system. And right now, we pretty much have no immune system. We are stressed out, exhausted and our immune systems are shot to HELL. As we sat talking with Dr. L., he told us a story of a High School friend, who had lost a child 30+ yrs ago. He told of how he went to a class reunion and this friend was there with her husband. We talked a little about the accidental death of his friends small child. The boy was swimming and for some reason, got out of the pool all wet from swimming all day..and touched a live wire. He died within minutes. Right there in front of his family, who had been having a pool party with the neighborhood. Dr. L., says that to this day, his friends eyes tell the pain and sorrow that is still there. That is never ending. Another story he told us the other day was about a married couple who come to him as patients too. They are in their 80's. Just so happened they were in to see Dr. L., on the 45th anniversary date, of the death of their young son. Doc didn't get into any details of their loss, other than telling us that 45 years later and the tears were still streaming down their faces. Dr. L., told us that he never knew of the loss they had suffered years before, but that he did notice the look in the eyes of the mom. He said she always had the look of being lost. But up until that particular day, these parents had never said a word of the son they lost all those years before. I suppose the lost look in my eyes will remain with me throughout the rest of my life. Some may think our doctor shouldn't have shared those stories with us. Likely because, "it gives you no hope." But you know what?? We know this is going to be with us the rest of our lives. 5 yrs. 10 yrs. 20 yrs 45 yrs. Our grief will NEVER end. EVER! Sure our lives will go on. We have no choice in that. But trust me, if you see me out and about, all you need to do is look into my eyes and you'll know the grief and sorrow are never ending. All because, "the eyes can tell a story." 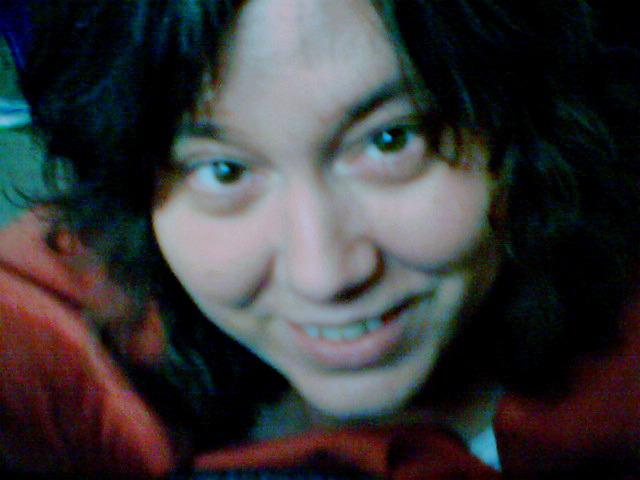 The following picture is of me...taken by Carly last February. She took it with her Fisher Price Camera, a gift from "HO HO" (Santa). You see that happy person in that picture below?? Well, sadly, she doesn't exist anymore. This person in this picture, doesn't even look the same anymore. Every part of my face is different now. In just one year, that happiness that shows very clearly in this picture,,,,, is gone. you just get through it. because you can't get around it. Grief puts on a new face." Cleaning out our bedroom proved much more difficult than even I could have imagined. Oh my gosh, it was AWFUL. Such a heartache. We cried. We cried in a wailing way. Not just crying our everyday tears. Those fall freely on any given day. At any given time. As I packed (I cringe when I even type that word) away Carly's clothing I could not contain myself. My wailing even had both dogs on high alert! They freaked! In some ways, it was just as comparable to me, as the loss of Carly. By no means was it the same, but in many ways it was comparable. A finality. Paul and I both were wailing. Hard deep wailing as we packed more and more things. Unloading dressers. Loading up totes. HORRIBLE. Horrible heartache. I placed all of Carly's tiny little clothes neatly into several plastic totes. Her socks. Her tights. Her underpants. Her undershirts. Her pajamas. Pants. Shirts. Dresses. Skirts. Coats. Snow pants. Hats. Mittens. Belts. Shoes. I tossed out not one single thing. And probably, I never will. Paul took Carly's toddler bed apart one Sunday morning before I even woke up. He had such a hard time doing that. I heard him crying, but really had no idea he was taking her bed down. He cries often. And often times wants to be left alone. Taking down the bed was just too final. Granted, she rarely slept in it! Nonetheless, it was HERS. And it was cute and pretty, just like a little girls bed should be. I had a hard time taking her crib down and putting her into a toddler bed. How could I have witnessed taking her toddler bed down? Forever. Our new bedroom furniture finally did come. It only took 11 1/2 weeks to get here! Paul painted our room and it looks completely different now. It feels different too. Which I haven't yet decided on whether or not those are good things. Looking different and feeling different. Still undecided. We had intended to buy new carpet for our living room and our bedroom, but since our water pump went out on us a couple weeks ago...and, we had to shell out $1250.00 to get a new one...well, our new carpet gets put on the back burner for now. Here's a peak of our bedroom furniture. We really do like it, but would of course much prefer having that little toddler bed back in it's rightful place. Along with it's rightful owner. As I look at these pics, they really don't do the furniture justice. It's much richer in color than I was able to capture on my camera. Especially the above pic. Ah, this pic is a better idea of the nice rich, cherry color of the furniture. Not sure what happened in the other pic..but, who cares! As you can see in the above pic, I have a couple of Carly's stuffed animals along with a few other items on my dresser. The lamb, is a wind up musical that plays, Twinkle Twinkle Little Star. A gift given to Carly during her first heart surgery, from my cousin Cyndi and her husband Brett. Carly LOVED her lamb. It remained in her bed every night. The pink bear was a gift from the recovery room, after one of Carly's many surgeries, (2 heart and 6 caths. 7 surgeries for port placement, broviac placements and all the removals) I believe it was given to her after the final removal of her port. She LOVED this little pink bear too. I almost buried her with it, but since we planned to bury her with her Strawberry Shortcake Doll, I selfishly wanted to keep something that she loved. There is also a tiny pair of porcelain pink booties with her name on them sitting near the pink bear. Those were a gift from Paul after I had Carly. A little Cherished Teddy holding a wand sits atop my dresser too. It was given to Carly by my Aunt Joan, (yes, I'm named after my mom's sister). This was the only ornamental type thing that Carly ever messed with. She would get it off of her dresser and kiss it and prance around the house with it. But, she always put it back. She never bothered any knickknacks that I had sitting out. I never had to "baby proof" my house for her. At least not for the knickknacks! The C was made by Ashleigh's friend, Kelsea. She made it for Carly during High School art class. It used to set on the top of Carly's dresser and now, it will remain on mine. As I said above, still not sure of how I/we feel about the different bedroom. I did return to our room. My first night in my bed in over 8months, was so eerie. Definitely missing Carly laying between us. Not the same. Never will be again. I felt as tho I was missing a limb while laying there. A description that I use often as I talk to our doctor about how I'm doing. I actually feel as if I'm walking around without a limb. Weird I know. Some will not understand that whole, minus a limb thing, but if you've been there, you get it. Other than our new furniture. Life continues to go on. It's not easy. Not by a long shot. But, we have no other choice. We talk often of Carly. We laugh over our memories and we cry over our memories. I just hope I never forget. I want to remember everything about her. EVERYTHING. I did buy a journal to jot down my memories. But I still fear of losing memories. The one thing I know I/we will never lose, is the love inside of our hearts for our little girl. Altho., we will never escape, our horrible heartache.